Christmas banners went up in High St yesterday. THE Derwent Valley Council has set a new record with the much earlier than usual installation of Christmas banners in High St. 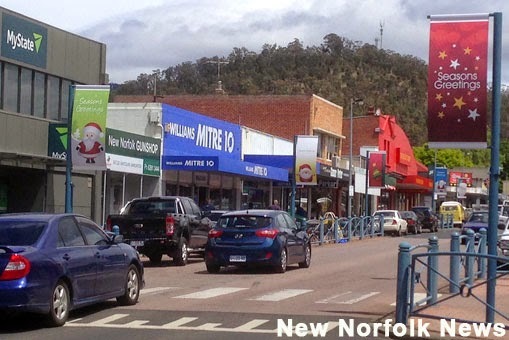 The welcome arrival of some Christmas cheer is the result of an ongoing initiative of the New Norfolk Business Alliance with the installation of custom-made banner poles down one side of the street late last year. These have recently been supplemented by additional poles along the post office side of the street. The Christmas banners went up yesterday and is a vast improvement on previous years when the erection of the old-style decorations was a much more complicated affair. The unique design of the banner poles allows them to be lowered by hand for the installation and removal of promotional banners. Community groups can contact the council about having their own banners displayed, as the New Norfolk Lions Club did recently. Good on you New Norfolk businesses, it's great to see the business levy payers giving back to the community which supports you! Now to work on those shop window displays - come on,don't just let a few be creative!